Rare books by Enid Blyton, including first editions and signed first editions of The Famous Five series, and The Secret Seven. 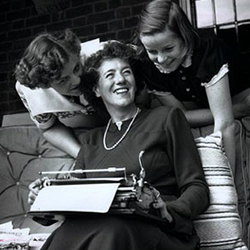 Enid Blyton (1897–1968) was one of the twentieth century’s most prolific children’s authors and the creator of the Famous Five series. As a child Blyton was noted for her gift of storytelling, and in 1922 she published her first book, a collection of poems called Child Whispers. At the time she was working as a teacher, and she became a popular contributor of poems and short stories to Teachers World magazine. By 1924 Blyton was making a steady income from her writing, and two years later she began editing the children’s magazine Sunny Stories (the title was changed to Enid Blyton’s Sunny Stories in 1937), in which many of her books would were serialised. The first full-length book published in this way was The Wishing Chair in 1937, followed by The Secret Island (1938), in which four children live like Robinson Crusoe on an island in a lake, The Enchanted Wood (1939), which introduced the Faraway Tree, and her first boarding school story, The Naughtiest Girl in the School (1940). “These early books illustrate the wide range of genres in which Blyton wrote and represent some of her best work” (ODNB), but it was the Famous Five that would become her most popular creation. The children made their debut in Five on a Treasure Island in 1942 and would star in an additional twenty books that were adapted for radio, theatre, and television and translated into numerous languages. In 1949 The Secret Seven became the first book in a similar series catering to younger readers, and in the same year Blyton created for toddlers the character Noddy, who first appeared in Little Noddy Goes to Toyland and inspired an extensive merchandise industry. Though later in her career Blyton was critised for certain story elements, she nevertheless “possessed an undoubted talent for making readers turn over the page to find out what happens next” (ODNB). Regularly stocked editions of the works of Blyton include the complete Secret Seven. Five Go to Smuggler's Top. Five Go Down to the Sea. Five Have Plenty of Fun. Five Go to Demon's Rocks.